The founding “mother” of Springfield’s Lithuanian-American Club was Mrs. Julia Wisnosky, who phoned Tom Mack, the local McDonald’s franchisee, with the idea. Shortly thereafer, in the summer of 1988, Julia, Tom, Georgeann Wisnosky (Julia’s daughter), Joe Turasky of Y-T Packing, Peter Urbanckas, Ann Traeger, George and Helen Rackauskas, and Fritzi Cartwright met in Tom’s Sixth St. office, and the Club was founded. The original officers drew from the ranks of these founders, including President Tom Mack and Vice President Julia Wisnoski. The Club’s first recorded meeting was Sept. 20, 1988, also in Tom Mack’s office. By that time, 425 letters had been sent out to local Lithuanian-Americans, and 165 had already responded and become dues-paying charter members. 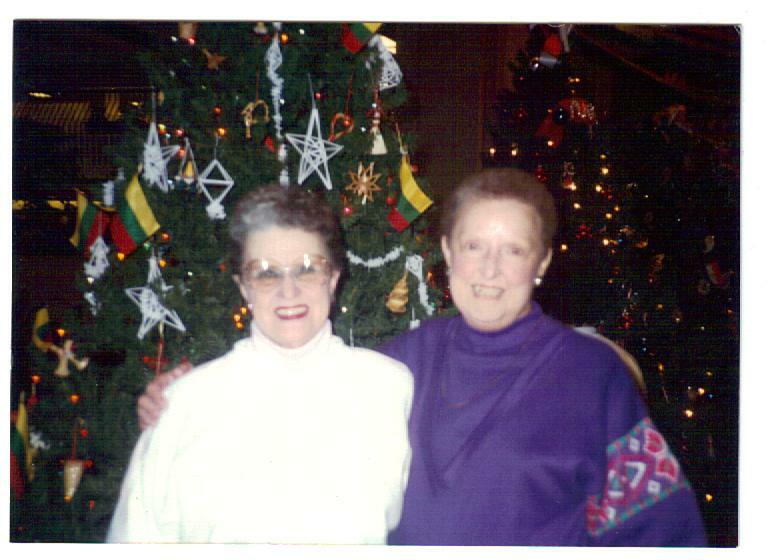 In addition, on or about Dec. 1, 1988, the Club sponsored its first Lithuanian Christmas tree in the “Christmas Around the World” exhibit in the lobby of the downtown headquarters of then-Marine Bank of Springfield, which paid the club $25 for its participation. Alberta Klickna spearheaded that first decorating event, which continued on a weeknight in early December for almost 20 years, through the purchase of Marine Bank by Bank One. During most of the Bank One years, wine, soft drinks and hot chili were provided by the bank, and various ethnic groups brought home-made desserts. High school choirs and the German Club from Springfield High sang holiday carols, and 10-12 trees were decorated, each by a different ethnic group. But “Christmas Around the World” was discontinued around 2009 when Bank One was purchased by JP Morgan Chase. Hello there, I’m researching a Springfield Lithuanian Family named Klickna/ Klikna/ Kleckna/ etc. I looked through your list of family names and didn’t see them listed. I just thought it would be worth asking, have you got any information on this family? Also, I’d like to compliment the effort and time you’ve put into this resource, it’s appreciated.